interlocking mats, 4 colours, , choose quantity above. 100% water resistant NON-SLIP interlocking mats, 4 colours, , choose quantity above. 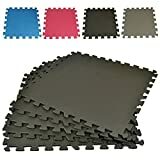 Edges not included Easy to clean mats are great for use around sinks and washers to help prevent slipping and to protect floors. Also great for use in workshop and garages to prevent fatigue by absorbing the shock associated with working on concrete. Can be used for almost anything!Easy to take apart (fit in a car or store at home/garage) PLEASE CONTACT US FOR BULK BUYS. This entry was posted in Fitness Products and tagged 600MM, Black, Exercise, FLOOR, FOAM, GARAGE, INTERLOCKING, kids, MATS, Office, PLAY, Soft by Summer 365. Bookmark the permalink.